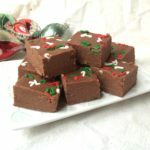 Ever since I made Andrea’s fudge recipe a couple of posts back, I’ve been thinking about how easy it would be to make a few batches into a really nice gift. I’ve been making and freezing a batch a day for the last five days and it turned out really nice! 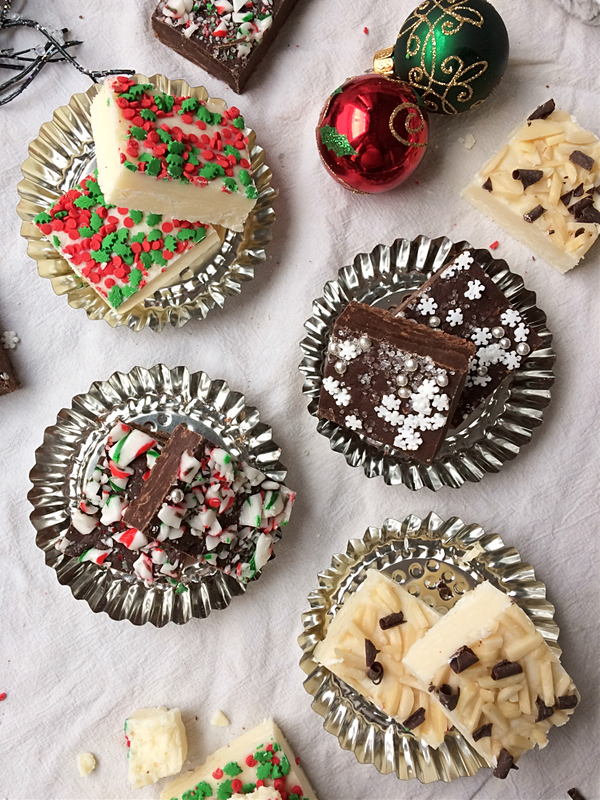 You don’t have to make 5 batches of fudge, just pick the ones you think your friends will like. 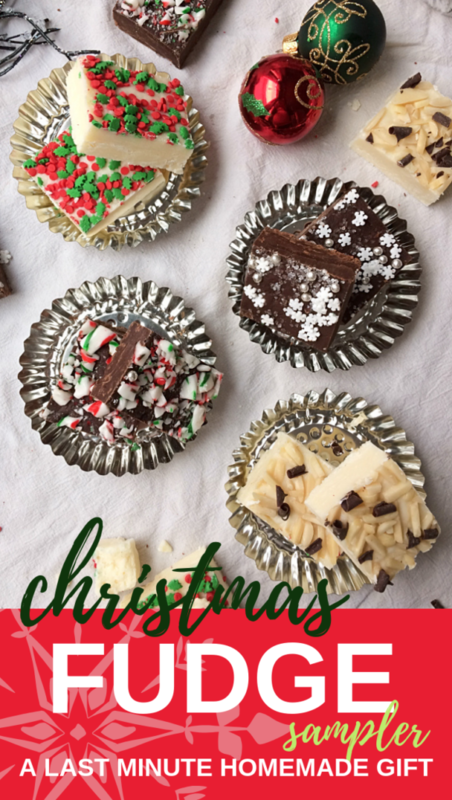 Grab your fudge ingredients and get started! Blend the ingredients for the Homemade Sweetened Condensed Milk very well. You can melt your butter and use boiling water to help dissolve the sugar and prevent graininess. Mix together and put into an 8×8 pan lined with parchment paper. Even out and put your mix-ins on top. Press down with a spatula. 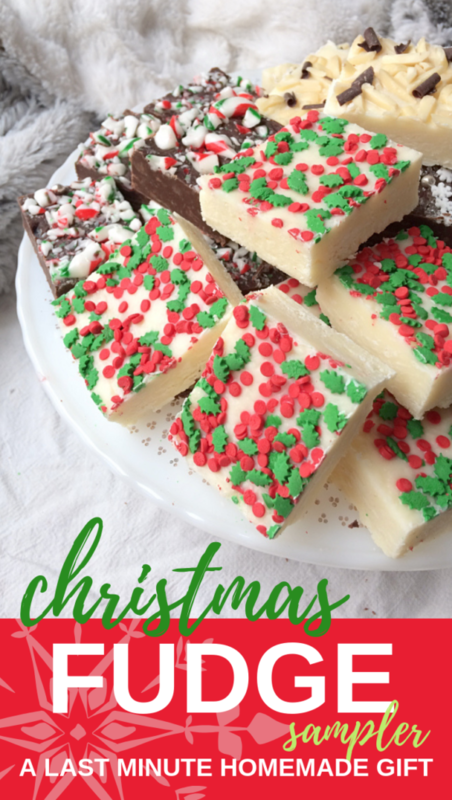 White Chocolate Candy Cane: 8 crushed candy canes, layered on top. Dark Chocolate Salted Caramel: 10 carmel squares melted with 1 tbsp butter, kosher or pickling salt. 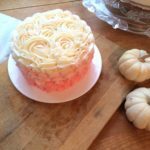 Now that I’ve made the recipe six times, I have some definite opinions on how to get the best results. First, the fudge actually tastes better if you make the homemade sweetened condensed milk, and is a lot cheaper! 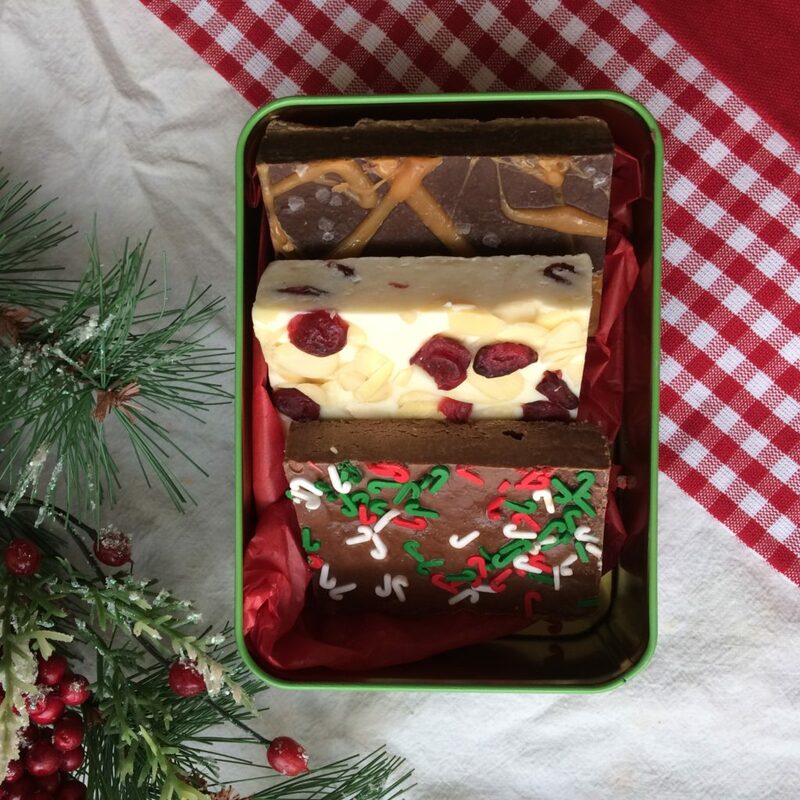 Second, your fudge will only taste as good as the quality of chocolate you use. I used melting chocolate (not chocolate chips or squares) and while it was cheaper and easier to use, it did not taste quite as good as the batch I used brand name chocolate chips. I recommend using the melting chocolate for any batches with white chocolate. I found that the brand name white chocolate was harder to work with. Third, don’t try to mix two or more colours of chocolate. 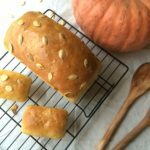 I thought it would be easy, but it wasn’t with this recipe. I put in a little bit of oil and made it work, but it changed the consistency of the fudge and I didn’t like it as much. If you’re curious, I did it in the candy cane batch. I tried to add red and green to the white but it just looks messy. Next time I’ll use just white chocolate. The recipe takes 30 minutes to make from start to finishing the dishes. I was able to make one batch every day, pop it in the fridge, and cut and wrap the pieces later when I had 5 minutes. You could easily make 3 batches at home over the course of a day if you needed to. If you have more than one 8×8 pan, lucky you! I may look like the crazy fudge lady (if you open my freezer right now you’ll see 40 individually wrapped chunks of fudge) but I have all my little Christmas presents taken care of. Now to conquer the rest of my Christmas concerts! OMG that looks soooo delicious! Thanks! 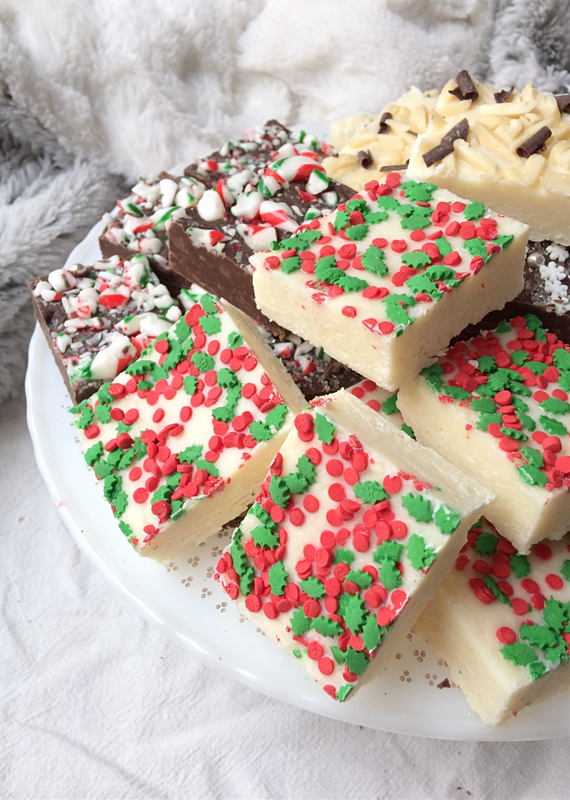 How did your family fudge recipe turn out this year? Can you freeze them? Thanks for the recipe. Yes! They freeze really well.